A cross-party campaign calling on politicians to pay all interns working in their offices has been backed by Cambridge MP, Julian Huppert. Julian attended the Parliamentary launch of Let’s Get Our House In Order and he promised to continue paying any intern he takes on in his offices in Westminster and his Cambridge constituency. The campaign is designed to ensure that young people from poorer backgrounds have the same opportunities as those who can afford to take long-term unpaid internships. 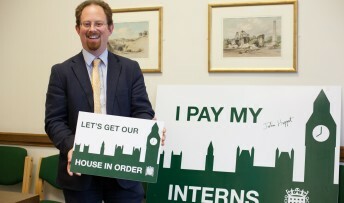 Julian said: “We need to send a strong message that long-term unpaid internships should be a thing of the past if we are to give everyone the same opportunity. Julian employs interns, who are paid at the Living Wage, and an apprentice in his Cambridge constituency office and has offered a teenager a nine-month position in his Westminster office under a Social Mobility Fund programme, to help people from more diverse backgrounds work in Parliament. He said: “Many politicians began their careers working as unpaid interns before going on to get a permanent jobs; but these internships are largely restricted to young people who can afford to live and work for free supported by their parents. Ben Lyons from Intern Aware, the campaign for fair internships, said: “We are really pleased to see Julian support this campaign.